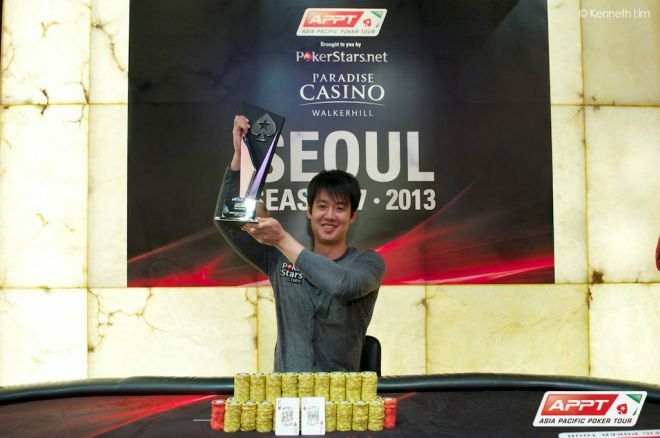 On Sunday, the 2013 PokerStars.net Asia Pacific Poker Tour Seoul Main Event officially came to a close. In the end, it was Aaron Lim who was able to overcome a 222-player field to attain KRW 121,700,000 in first-place prize money, the title and a seat to the APPT Macau Asia Championship of Poker Main Event. The third day of play saw 21 players return to the felt with the lone goal of being crowned champion of the first event of APPT's seventh season. One by one, players fell as the field was whittled down to the final table. Most eyes were on PokerStars Team Online member Naoya Kihara, who entered the day third in chips. Kihara continued to build a sizable stack throughout the day, but an unfortunate confrontation with start-of-the-day chip leader Lim ended Kihara's run. Kihara's poorly-timed triple barrel into Lim resulted in an 11th-place finish for Japan's first World Series of Poker gold bracelet winner. Lim, on the other hand, secured a death grip on the rest of the field by sporting 35% of the chips in play with 10 remaining. After one more elimination following Kihara, the final table was set. Casey Kastle was the first casualty of the final table. Most of his chips were shipped to Chane Kampanatsanyakorn when Kampanatsanyakorn hit trip tens to double up. Kastle was crippled from this hit and busted soon after in ninth place. The next player to fall was Masahiro Osada. With the blinds at 6,000/12,000/1,000, Nicky Tao Jin opened to 24,000 from the hijack. Osada three-bet to 68,000 from the button, and play folded back to Jin before he four-bet jammed all in. Osada called for his tournament life and tabled the to be flipping with Jin's . A board of landed Osada in eighth place. Soon after, Sung Soo Chon fell at the hands of Xuan Liu. At 8,000/16,000/2,000, Liu opened to 32,000 from the cutoff. A short-stacked Chon three-bet all in from the blinds for about 95,000, and Liu called. The board fell , and both players made a club flush. Unfortunately for Chon, Liu's was the higher of the two, and he was sent packing in seventh place. Chon collected KRW 23,800,000 for his efforts. Paul John Elliott was the next to go when he got his stack in before the flop holding the against the of Jin. "It's a flip," jested Jin to his friend Jordan Westmorland on the rail. Jin took the lead on the flop and never released his grip on the hand as the hit fourth street and the finished off the board. Five-handed play lasted for quite some time, and it was not until Sixiao "Juicy" Li three-bet her stack all in against Jin that fireworks occurred. Jin called Li's shove and came out victorious once again. Li took home a fifth-place payday of KRW 37,100,000. Only ten minutes later, the final woman in the field, Xuan Liu, met her demise. At 12,000/24,000/4,000, Jin opened to 48,000. Liu three-bet shipped all in for about 365,000 from the big blind, and Jin called. Liu showed the , but was behind Jin's . Liu failed to improve with the community cards, and she was eliminated in fourth place. The final three then took an unscheduled break to strike a deal. When they returned, Jin met his end at the hands of Lim who had the button and opened to 50,000 only to have Jin three-bet to 115,000 from the small blind. Action went back to Lim, and he four-bet to 255,000. Jin wasted little time five-betting to 400,000. Lim announced a six-bet all in, and Jin heaved a sigh before tossing out a single chip to signify a call. Jin triumphantly rolled over the and was way out in front of Lim's . The poker gods were not with Jin it seems, as the dealer produced a flop that gave Lim two pair with the . Jin was suddenly in need of a ten to stay alive, but did not find it on the turn ( ) or the river ( ). Jin packed up his belongings and headed out of the tournament area KRW 103,500,000 richer. Lim began heads-up play with about a 6-1 chip lead over Kampanatsanyakorn. Kampanatsanyakorn, however, was able to double up on the first hand and then double once again shortly thereafter. The heads-up battle continued for hours after this as Lim and Kampanatsanyakorn exchanged chips on the felt until the two were just about even in chips. About halfway through the 25,000/50,000/5,000 level, though, all of that changed. Lim made it 100,000 from the button, and Kampanatsanyakorn flat-called. The dealer showed them a flop of , and Kampanatsanyakorn checked. Lim continued for 110,000, and Kampanatsanyakorn replied by moving all in for roughly 1.7 million. Lim shrugged and called. Lim was out in the lead with his king kicker and was two cards away from the championship. The hit the turn giving Kampanatsanyakorn additional outs to chop, but it was not meant to be as the completed the board to eliminate Kampanatsanyakorn in second place. PokerNews extends its congratulations to Aaron Lim for taking down the inaugural event of APPT Season 7. Be sure to stay tuned to our live reporting coverage from across the globe week in and week out. In May, PokerNews will be at the APPT Cebu event.